With the treaty of Saint-Clair-sur-Epte in 911, the settlement of parts of the northern Frankish lands by peoples from Scandinavia was formalised by the creation of the fiefdom of Normandy, later to become a Duchy, which would in time expand and see the Normans conquer large areas of land further afield such as England, southern Italy and Antioch. Their military prowess was famed, and rightly so, but while the Normans would often be in the field on campaign, they spent very little of that time actually fighting, since most of the time was spent either on the move or in camp. Strelets have already delivered sets of Normans on the march, and this one brings us figures at rest or at play. This set follows the usual format of previous big sets from Strelets in that it includes figures from sets already released by themselves. 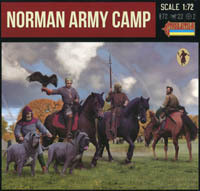 In this case the familiar figures are made up of the full Norman Train and Norman Cavalry on the March sets, plus two sprues from the Normans on the March set. There are two brand new sprues, which are pictured above, along with a further single sprue of the horses from the above-mentioned cavalry set, to provide the extra mounts for the new riders. Apart from the new pieces on the two new sprues, all the rest of the figures and horses are photographed and discussed in their relevant review, so here we will only concentrate on the new material in this set. We have grouped the new figures in this set by activity, and the first of these is feasting. Two men are carrying a freshly slaughtered animal while three others are already enjoying a meal while sitting on a log. The first of these diners holds a small bowl and has a spoon up to his mouth, and the second, with his back to us, is holding a whole fish skewered on his knife. He holds it against his right cheek, so we are presumably supposed to think he is eating the fish whole and starting with the head. While eating fish is fine, the suggestion that they ate them like this is pretty fanciful (and surely revolting too). The third man on the log is apparently drinking from a drinking horn, though this must be largely drained as the horn is being held horizontally. The last, solitary figure, sits on a very small barrel and gnaws at something still on a skewer. The eating theme continues with the first figure in row two, who is holding up a complete fish. Beside him is a really nice three-figure piece of men dancing, with one holding a cup, so generally having a good time. Less of a good time is being had by the next figure, which is of a man with his hands bound behind him and his belt hung round his neck, without the sword. Clearly a prisoner, he is supposed to be in the custody of the mounted figure next to him, who has a rope noose round the prisoner’s neck. The next row shows us four of the new mounted figures in this set, and covers a very important element of Norman life – the hunt. Royalty and aristocrats everywhere – not just in Normandy – were passionate about hunting, and went to great lengths to reserve the best hunting grounds for themselves. In a brutal age hunting was seen as enjoyable, and had the advantage of helping develop and showcase skills which would prove useful in war. Here we see a man about to lunge with his spear at a quarry, and another carrying a popular element of hunting, a falcon. The third is using a horn to give a signal, and the fourth is aiming a crossbow at something immediately to his left. Although the crossbow was certainly in use at this time, it may have been fairly rare as a weapon of hunting until the very end of the Norman period, but in any case this man has made the elementary mistake of holding the crossbow vertically (we might almost say gangland style today), which of course means his bolt is falling out and so harmful to no one! The next row continues the hunting theme with a man holding two dogs, plus a boar. The two dogs are very large, with heads that reach the man’s chest, and have the features of an alaunt or mastiff, both breeds that were widely used for hunting larger game such a boars. One seems to be leaping forward, so we imagine the man is having a hard time avoiding being pulled over, particularly as both leads are very short. The picture of the masters for this group show the leads matching the hands of the man very well, but the reality is this is not so, so some work is required to get these three pieces to work together as they were intended. Nice idea though. The fourth piece, as we have said, is a boar, a very popular object for a hunt. The one here is about 15 mm high at the shoulder, and 25 mm long. Scaled up this means the animal is quite a big example for boars in northern Europe, and unrealistically big for animals found around the Mediterranean. Its shaggy coat and mane are nicely done here, and on its left side it has a sort of peg which is presumably supposed to be evidence of a broken off arrow or spear, though very thick and far too neat for either. The last two rows are a bit more eclectic in terms of theme. First we have a fully-armoured man carrying a bag and pulling a child, but we were not sure why, though some families may well have been part of a Norman military camp. Next a soldier with drawn sword, who on the box has been displayed with the two women next to him. Perhaps this is supposed to be depicting a man chasing some intimate female company, though both women are well dressed and look much more like wives of nobility than the usual prostitutes you might find in any army camp. Add to that the observation that one is carrying a baby, and they start to look more like prisoners, recently taken, and about to suffer some indignity at the hands of their captor. The last row starts with a man holding up a torch, and continues with a mounted man with a woman slung across his saddle. He wears no armour or helmet, and has his sword sheathed, so this is not a battle pose, but wherever he is taking his burden she is clearly not happy about it, as her distressed expression readily shows. Lastly we have two people making music. The first is a lady seated on a locked chest playing a harp, and the second is a man standing, wearing a full hauberk but unarmed and playing what looks like a fiddle or lira, which is the ancestor of the modern violin. Having talked a lot about the poses pictured above, we should briefly consider their relevance to the title of the set. The people eating and drinking are of course very appropriate, and we could imagine the detained man being some sort of looter or other transgressor being brought back to face justice. Hunting would have been a popular pastime when on campaign as well as during times of peace, but the last few poses are more difficult to understand. The well-dressed women do not seem like ordinary camp followers, and the lady playing the harp would not be likely in a military camp, though perhaps she could be accompanying her senior officer husband in his tent. Many of these figures work equally well for ordinary civilian scenes, so in our view the set works better in that way than simply as a military camp. Like everyone of the time, the Normans ate meat with a knife and their fingers, so we were not at all taken with the man eating a whole fish on a knife. The noose does not fit over the head of the prisoner, despite what the box shows, so needs to be split first. The man with drawn sword is an odd pose overall, and the crossbowman has been made to look silly simply to allow the crossbow to be moulded as one with the man. However most of the poses are nicely done and relevant, and we particularly liked the pieces made up of multiple figures like the dancers and diners, which work very well. Some of the men wear mail armour, but others have their ordinary tunics, as they would when away from battle. The styles vary, but all look good, though for example those hauberks with long sleeves are more relevant for the later part of the period. Most wear hose under their tunic, but the prisoner seems to just have his braies on, as does the bare-chested diner on the log, though they could also be the old-fashioned Germanic trousers. All the clothing and armour looks OK, but we could not make out the clothing of the man holding the fish to his left. He wears a tunic and what look like trousers with wrappings on the lower legs. He also wears a small cap which we could not authenticate at all, though it looks suspiciously like the sort of cap worn by cooks today. The sculpting is reasonably good for Strelets, without the chunky feel to the figures we have often observed in the past. However smaller items and details are still somewhat exaggerated or unclear, so for example the lady’s harp is crude and unattractive, and the box held by the fiddler has several issues. On our sample there was some flash around the seams, but nothing too serious, and no excess plastic, despite the several quadrupeds in the set, all of which are pretty well done. The extra sprue of horses for the mounted figures are not ideal as many are at full gallop, but we understand the reasons why a new set of more sedentary animals was not made. As an illustration of Norman camp life this is a pretty fair set. The hunting figures were our favourites, but all the poses are OK and many could just as well grace a scene inside a castle or a village as be on campaign. Nice detail and generally well-proportioned figures make them quite appealing, and in fact about the most attractive one is the bonus Streltsi figure, who is particularly finely detailed and looks very good. Despite some small reservations we liked this set very much, which will be a particularly useful collection for all those looking to model a broader range of subjects for the medieval period beyond warfare. 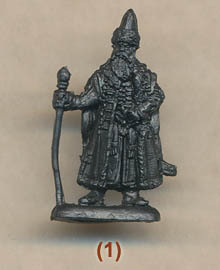 Note The final figure is of a soldier (actually a senior officer or even a noble) from the Streltsi of 17th century Russia. Though he is unrelated to the subject of this set, he is one of a series of 'bonus' figures which when combined will create a set of this unit for the Great Northern War. See Streltsi Bonus Figures feature for details.